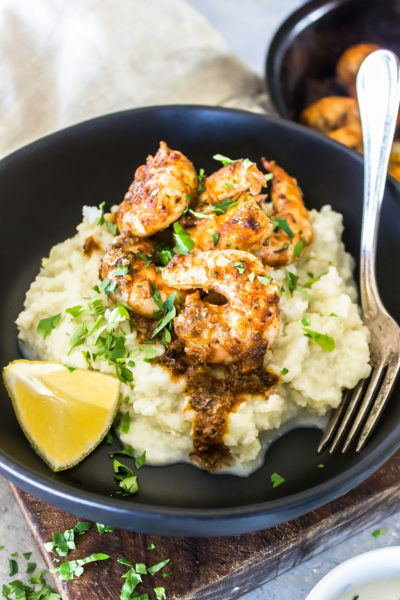 This 5-Ingredient Paleo Shrimp and “Grits” is packed with flavor with only minimal ingredients! Heat 2 tablespoons of the ghee over medium high heat in a large skillet. Add the shrimp to the skillet and sprinkle with the cajun seasoning. Stir, then cook 1-2 minutes per side until pink and cooked through. Add the lemon juice to the skillet, scraping any stuck on bits up from the bottom. Remove from heat. Microwave the cauliflower rice, garlic salt, and remaining ghee together until soft, about 4 minutes. Transfer to a blender and blend until almost smooth. To serve, top the “grits” with the shrimp and sprinkle with parsley.